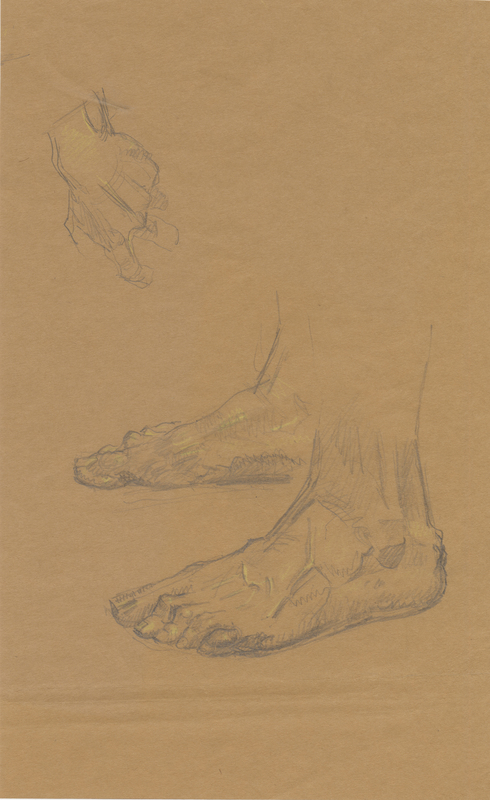 Book of Mormon Central / Archive / Study of Abinadi’s Feet from "Abinadi Delivers His Message to King Noah"
Title Study of Abinadi’s Feet from "Abinadi Delivers His Message to King Noah"
13 1⁄2 x 8 1⁄2 in. With these words, Abinadi prophesied to the wicked King Noah and his priests. Arrested and placed in chains, the prophet Alma was taken to the court in order to answer for his vocal condemnation of evil he saw in the kingdom. Intending to label him as a warmonger, the evil priests asked for Abinadi to interpret Isaiah’s word about publishing peace. Abinadi responded by using his greater understanding of Isaiah and the prophecies of Christ’s coming to the condemnation of the priests. Here we have Friberg’s finely wrought study of the prophet’s feet for the painting Abinadi Delivers His Message to King Noah. The model for Abinadi had personal significance for Friberg. Years earlier, the model—known only as Brother Altop in Friberg’s biography—had been instrumental in converting Friberg’s family to The Church of Jesus Christ of Latter-day Saints. More than 20 years later, Altop happened to visit Friberg while he was at work on the painting, whereupon the artist used him as the model for Abinadi.